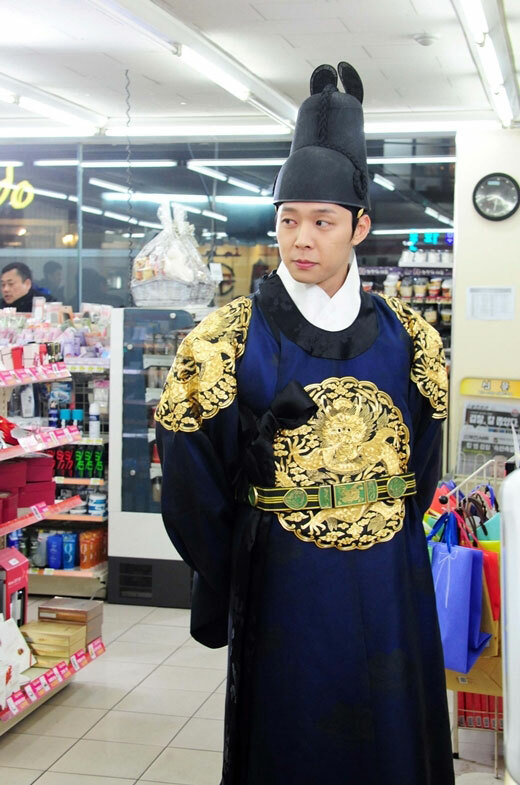 Park Yoochun of SBS Wednesday and Thursday drama Rooftop Prince has changed. From the comedy acting by Crown Prince Lee that time traveled from Joseon Dynasty in the first half of the drama to recent romantic transformation, he is noteworthy. Lee Gak believes from the relationship of Yong Tae Yong (Park Yoochun / 1 person 2 roles) with him that this is the reincarnation and decides to adapt to modern life in Seoul. In this process, he with the confidant trio (Jung Suk Won, Lee Min Ho and Choi Woo Shik) trigger a lot of funny stories. Then, he cuts short the hair, the red workout cloth also changed to clear and stylish suits, showing a handsome style as modern people. In particular, the love triangle between Park Yoochun with Park Ha (Han Ji Min) and Hong Se Na (Jung Yoo Mi) also excited a lot of female viewers. In the 5th episode of Rooftop Prince broadcast on April 4th, 2012, Park Yoochun stages a love posture with Han Ji Min. Lee Gak misunderstands Park Ha who bent over to take the human doll as attempting suicide, and unintentionally hugs her from behind. And he also blocks Park Ha who is on the way to United States, and says, “Without my permission, you’re not allowed to go anywhere, the tropical beach is here. Now, there is no need to go such a faraway place.” And he grabs the wrist of Park Ha and pulls her out of the bus. He then says looking at the tropical beach painting, “The good memories start from now,” deeply moving Park Ha. Park Ha previously said, “There is no good memories for me. When feeling tired when earning money, I have the fantasy to rest under the tree. Even if never been to such tropical coast, by pure imagination is also delightful,” and let him see that background of her mobile phone which uses a tropical beach as image. In the episode 6 of Rooftop Prince broadcast on April 5th, 2012, Park Yoochun is working with Hong Se Na. Lee Gak firmly believes that Hong Se Na is the rebirth of the Crown Princess in the past. He tells Hong Se Na, “I’ve seem to have seen you.” But Hong Se Na said, “Recently this technique is not in the trend. The technique used by man to get close to a woman.” He is very embarrassed. But Lee Gak does not give up. He asks Park Ha on what kind of dating girls prefer recently, and then applies it in tact on Hong Se Na. Park Ha said, “Will happy if riding couple bike.” So he learned to ride a bike. Hong Se Na who is indifferent to Lee Gak prior to this started to have change of feelings after receiving the gift. Netizens commented on the romance of Park Yoochun, “It’s most handsome when Lee Gak looks at Park Ha with deep eyes,” “Lee Gak who conquers Park Ha and Se Na at the same time is ‘bad guy,'” “Lee Gak is so handsome when gifting Park Ha the tropical beach painting,” “Touched by the bracelet gift, where to find such a man,” “Lee Gak tells Hong Se Na she will fall in love with him in the preview video, really fickle in love,” and so on.